The heroes delve into a subterranean dungeon complex beneath the caldera of a dormant volcano in the Mindspin Mountains, where they must infiltrate the elite military academy that trains officers for the Storm Tryant's giant army. 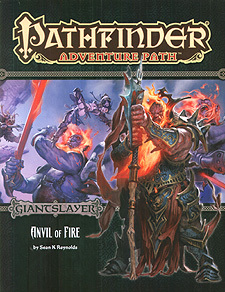 If they can survive the giants, dragons, and extraplanar menaces that have assembled under the Storm Tyrant's banner, the heroes will have an even larger challenge before them - facing off against the fire giant general-king Tytarian before the Storm Tyrant sets out to conquer all of Avistan! Advice and new options that allow you to harness the destructive power of volcanoes for your game, by Ross Taylor. A case of poor judgement turned dangerous in the Pathfinder's Journal, by Wendy N. Wagner. Five new monsters by Benjamin Bruck, Mikko Kallio, David Schwartz, and Jerome Virnich.